Hello and welcome to another blog interview. Today I have the pleasure to introduce you to Jennifer Borges Foster of Tickerfinch. Hi Jennifer! "Tickerfinch" sounds interesting. Is there a story behind your Etsy-Name? I wanted a name that was sonically pleasing and personally meaningful. My family has called me bird all my life, so I used that as a launch pad. When I considered the driving forces in my life, having a big heart topped the list, and this was what eventually captured the name: ticker = heart, finch = bird. 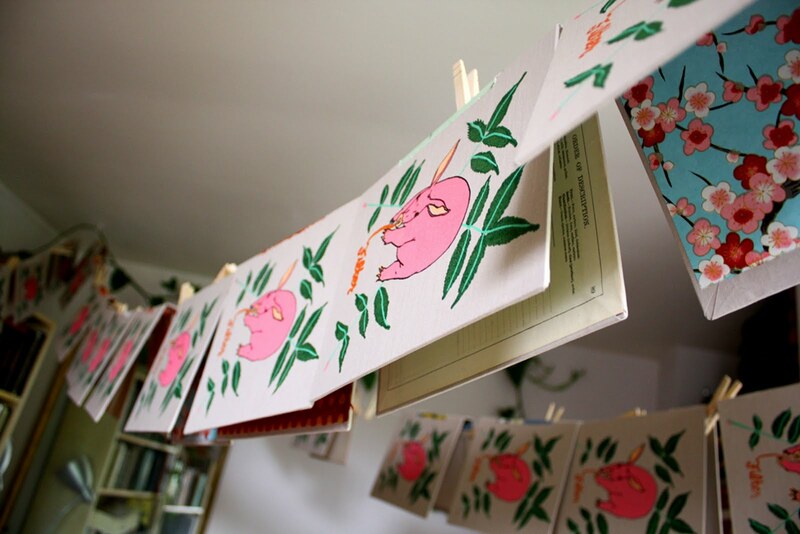 How and when did crafting and bookmaking come into your life? I’ve always been a maker – I sew, weave, paint, write, screen print… I’m fascinated with how things are put together (and how I can take them apart). I’m a poet and an editor, and it was being in the literary world that brought me to bookmaking. I first started making books by hand after working at a college literary journal - we spent hours and hours choosing poems, editing, laying everything out and designing it to all come together, but after sending the file to the printer, the books we got back felt flat to me. It was as if we built the skeleton of this creature, carefully filled it with organs and covered it in sinew and muscle and sent it away for its skin, and it came back covered in flimsy cardboard with some lipstick smeared on its face. 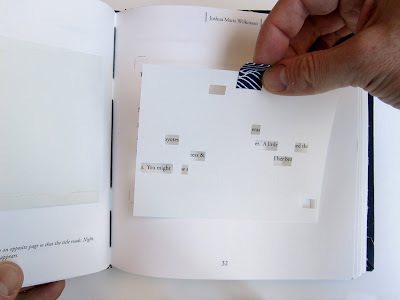 I then decided to take a class at The Seattle Center for Book Arts, and within minutes I was hooked. 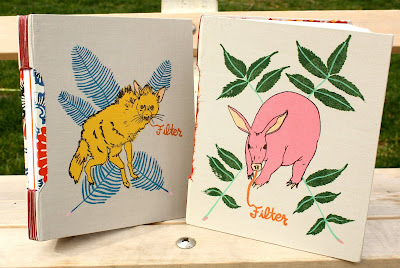 I had been making journals and wedding books for myself and friends for years, but it was only after selling copies of the second edition of Filter on Etsy in 2009 that I started making journals for the general public to purchase. Tell us a little more about your shop and about what you sell. 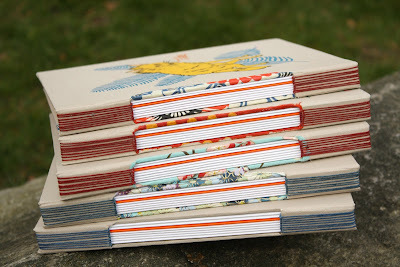 I make and sell mainly journals in my shop, and I often make wedding guest books as special orders. I make my own book cloth out of linen and silk for most of my books, and I do a lot of embroidery work on them. Fox Sleeps In is one of my favorite examples of embroidery and fabric arts in my bookmaking: I prefer the depth and texture of fabrics to book cloth, in many cases. I only use manufactured book cloth when I need a super clean finish on a book for screen printing or ink. 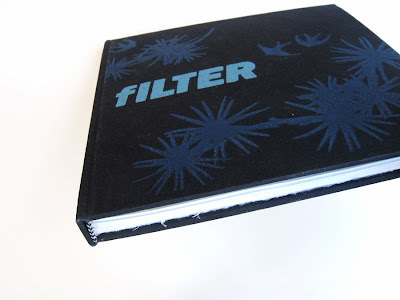 After doing the first edition of case-bound copies of Filter, I became interested in alternative bindings. I love langstich and button hole bindings, and most of my journals are bound in that style. That all sounds like creating is your main job. I am a poet, which clearly is not a money-making profession. I’ve been lucky enough to get grants to pursue my writing, and I teach book making and poetry to kids and adults at The Richard Hugo House and other venues around Seattle. As a bookmaker, I’m mostly self-taught – I read a lot of books about bookmaking (thanks, Keith Smith!) and I copy bindings that I see until I get them right. Do you have a special way or place to get fresh ideas? My favorite place in the universe is the Special Collections Library at the University of Washington. 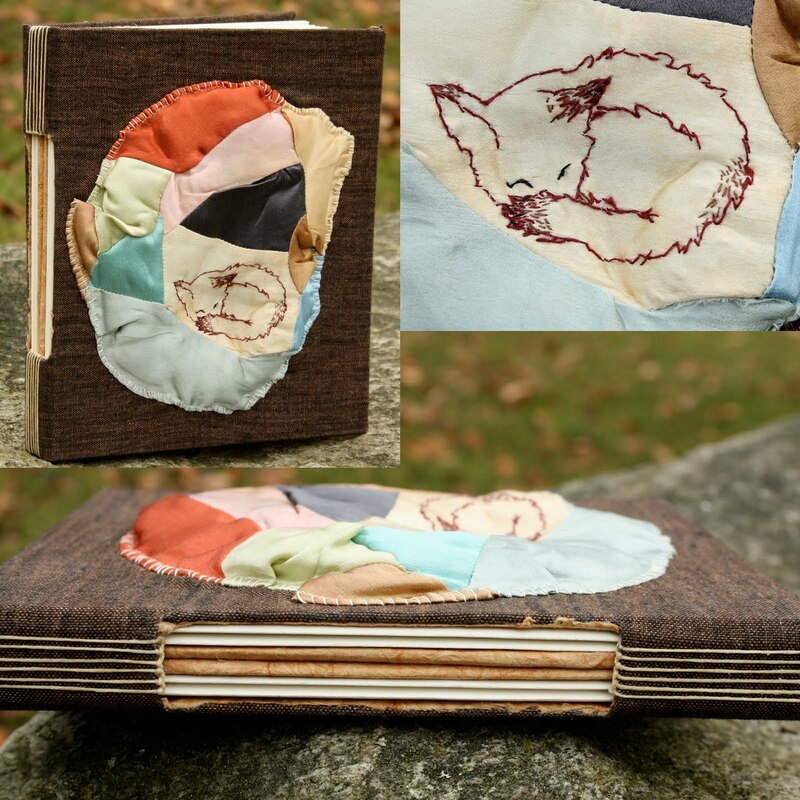 Sandra Kroupa, the Special Collections Librarian, is an amazing resource for local book artists. She has dedicated her life to collecting handmade books, and an afternoon with her and a cart of books is a transformative experience. I am always deeply humbled and inspired after viewing some of the incredible work she houses there. I also love seeing what people are doing on Etsy! There are so many creative and talented bookmakers showcased on Etsy, and looking through the different bookbinding stores is, again, both humbling and inspiring. Do you have a role model or is there someone who especially influenced your work by example or mentoring? In 1953, Daisy Alden created a literary journal called Folder. She typeset the entire journal by hand, and had parties with her friends to put the books together. I love the feeling of both hard work and camaraderie that came from her creation. She said “When you send something beautiful into the world, it finds it’s own way.” – this is what inspired me to learn how to make books. What can we expect from tickerfinch in the future? - Any new projects going on or products planned? I’m working on a third edition of Filter right now, and I’ve brought on several editors and a letterpress printer for this third edition. I always rely on my good friend and designer Kim Drake to help me design and layout the poems, fiction and art in Filter – I don’t know what I would do without her! I’ve made a few journals for friends and fellow writers that include machine typed prompts and hand-painted erasures as inspiration. It can be a little intimidating to start writing in a beautiful, blank handmade book – adding prompts and art makes the book a collaboration, which is less intimidating. I’ve gotten great feedback on them, and will start making them for my shop next year. Thank you, Jennifer, for taking your time to talk with me! To see more of her books, check our tickerfinch on Etsy and do take the time to head on to her homepage tickerfinch.com. You will find there a slow blog on diverse topics of everyday life from recipes to putting poems to sleep like babies, written with whit and not lacking a certain self-irony. Jennifer's books are gorgeous and so inspiring! I write in one every day.